Scale Model News: FEELING BLUE? THEN NOSFERATU IS THE VAMPIRE FOR YOU! FEELING BLUE? THEN NOSFERATU IS THE VAMPIRE FOR YOU! I was watching The Simpsons recently, and it reminded me that there was a kit I’d acquired some time ago, but had yet to build. 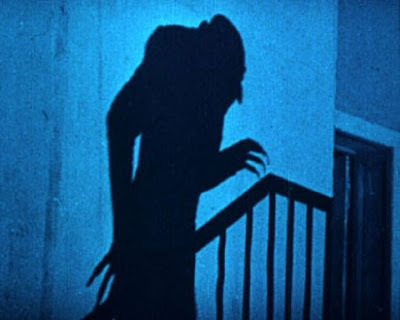 It was a figure in the style of the old Aurora kits, of a subject that Aurora perhaps should have done, the original vampire movie of 1922, named Nosferatu for copyright reasons. Later versions of Count Dracula by Bela Lugosi and Christopher Lee set the benchmark for what a self-respecting vampire should look like (it was good enough for Grandpa Munster, after all), but the German actor Max Shreck’s portrayal of Nosferatu was far more frightening, even though - or maybe because - the movie was black-and-white and the vampire was seen mostly only in shadow. The Canadian model company Monarch Models, run by Scott McKillop, is one of the companies often cited as the ‘new Aurora’, along with Polar Lights and Moebius Models. 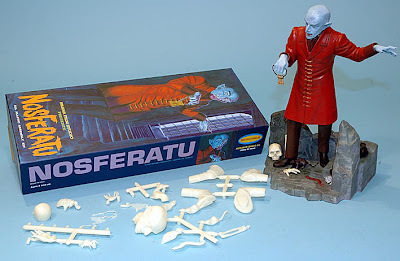 Monarch’s Nosferatu has been nicely produced in the style of the original Aurora company, even down to the vertical blue box. The only real change is that the instruction sheet is in full colour, whereas Aurora’s would have been black and white. 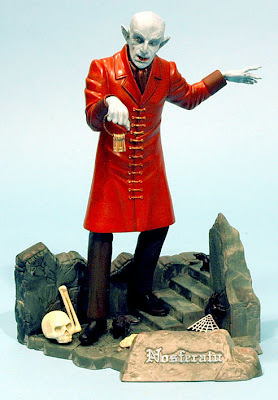 The features of the model match Max Schreck as Count Orlok, aka Nosferatu the vampire. He is shown descending the steps to his cellar, with added features (again typical of Aurora) that include a spider, centipede, human bones and a couple of rats. There’s also a version that includes luminous parts, which is just as well, as the standard version has a 'Sold Out' sign. Oh, and The Simpsons reference? Mr Burns of course. Apart from having an uncanny likeness to the undead, he actually took on the role in Treehouse of Horror IV, which briefly featured a scene with a passing nod to Nosferatu. 3 Nosferatu assembled on base, blue skin and all. 4 Colorized frame from the 1922 movie. btw German director Werner Herzog made an excellent 1979 remake, which is well worth a look if you’re into the genre. Visit Monarch Models here. You may have to reload the page, as it seems to be a bit iffy at the moment. DVDs of the movies are available on Amazon here.